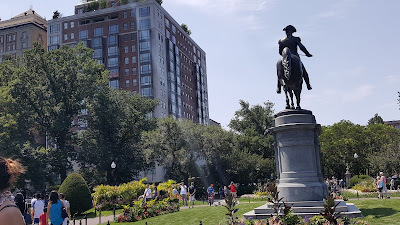 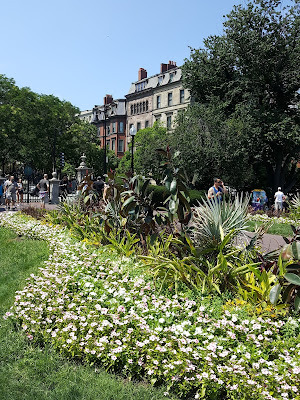 Our trip started in the historic Boston Common. 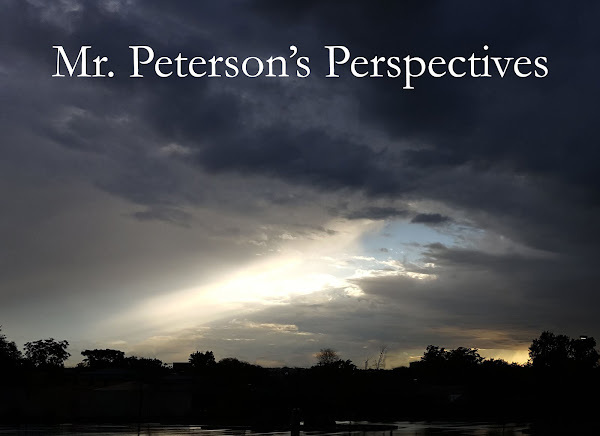 This 40+ acre site has never been developed since pilgrim times and has served as a symbol of American political self-reliance since its creation. The British military exploited this symbolism by occupying the space in 1768. 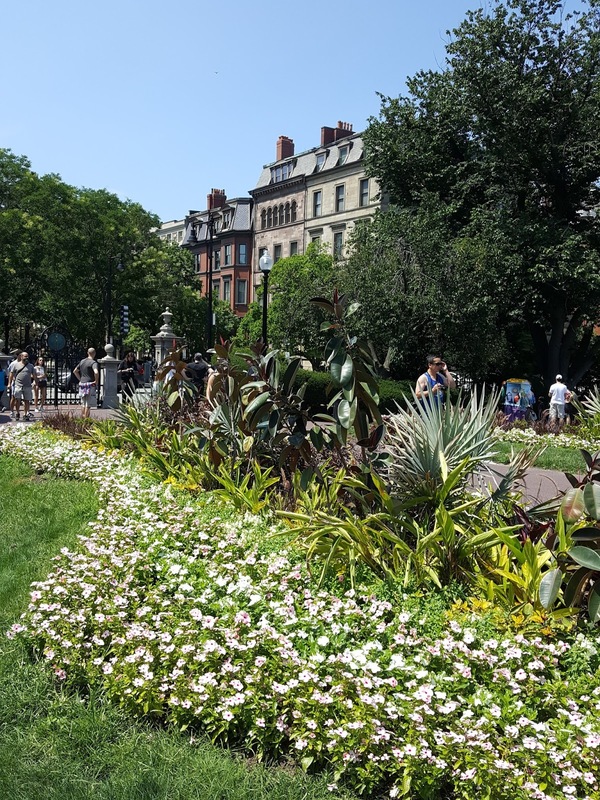 The open green space is full of monuments and also surrounded by other parks and important landmarks. 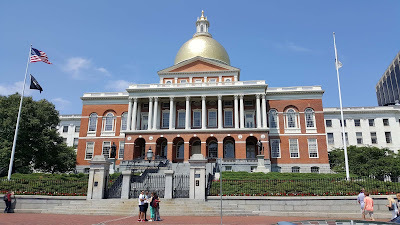 This amazing building is found on Beacon Hill. 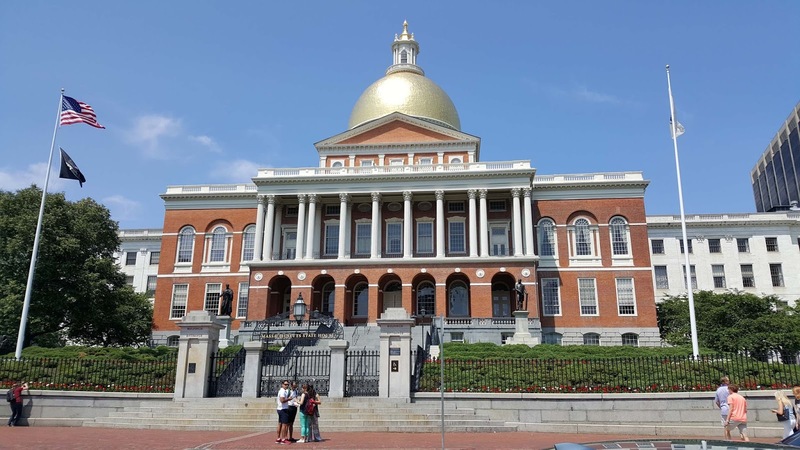 The Massachusetts Legislature comprises of 160 members in the House and 40 members of the Senate. 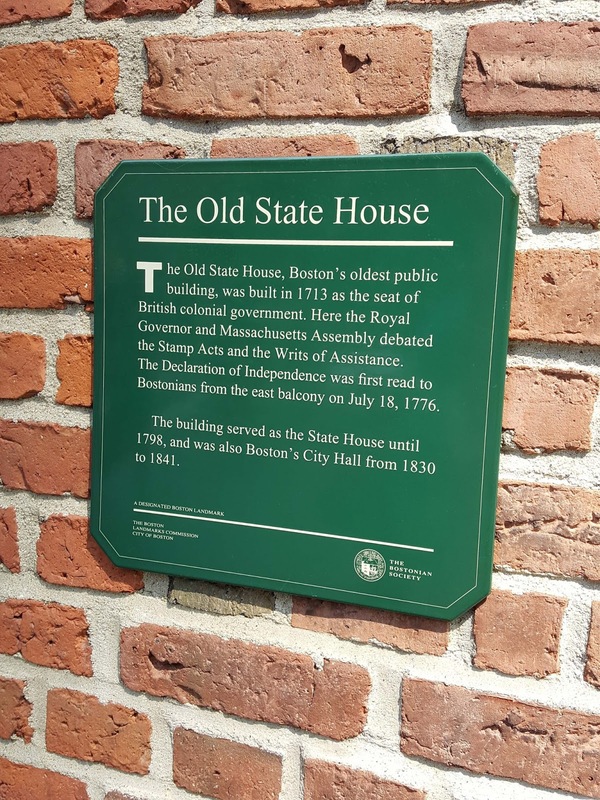 The building was completed in 1798 at a cost of $133,000. 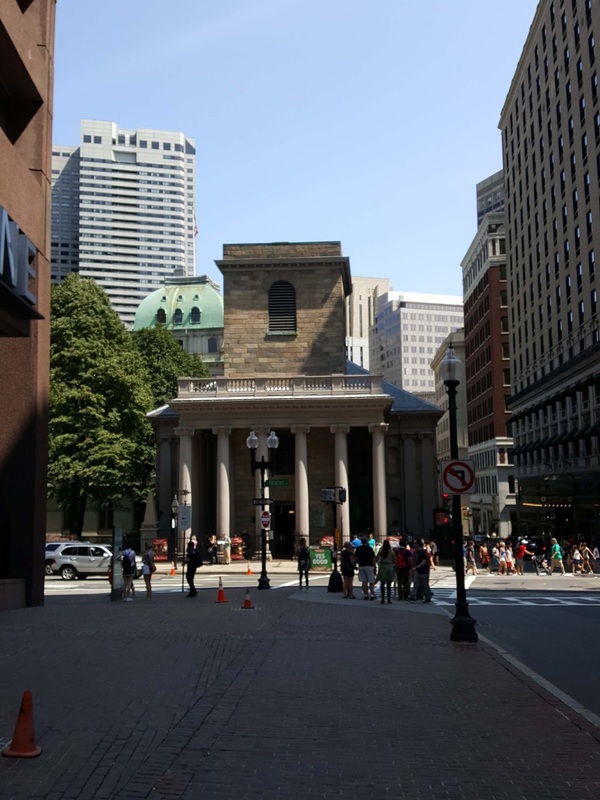 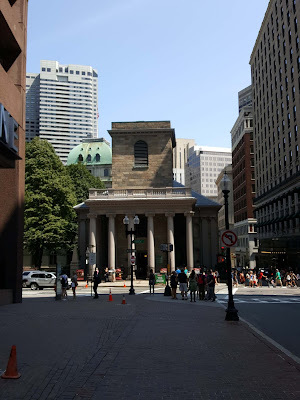 Our next stop was Park Street Church which was a center of Abolitionist activity and served as a local gathering place. 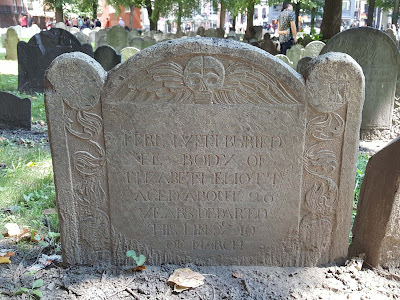 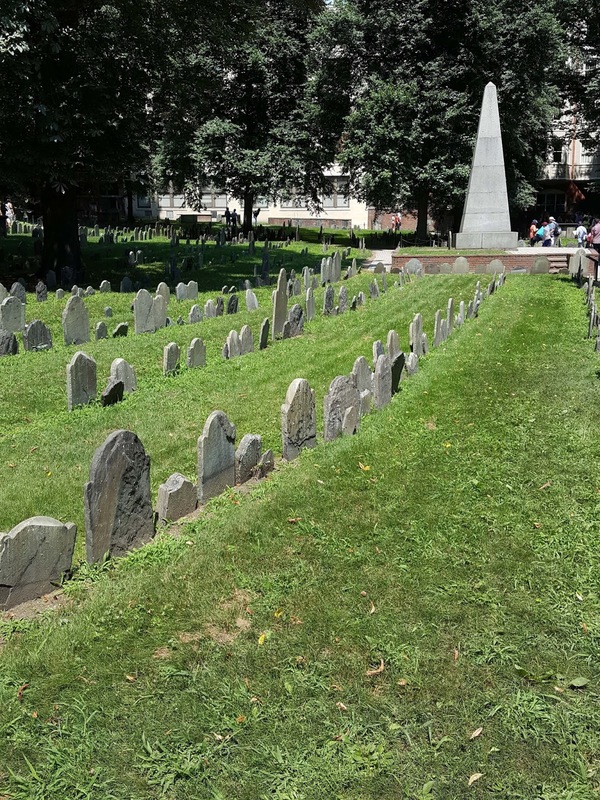 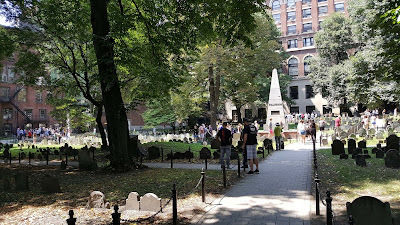 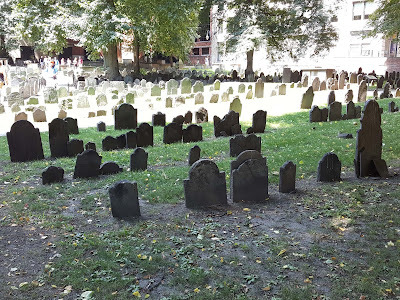 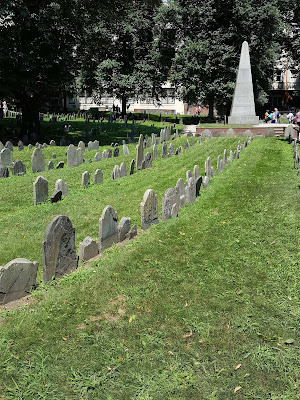 Behind the Park Street Church is a graveyard that holds the bodies of thousands of people (mostly stacked on top of each other). 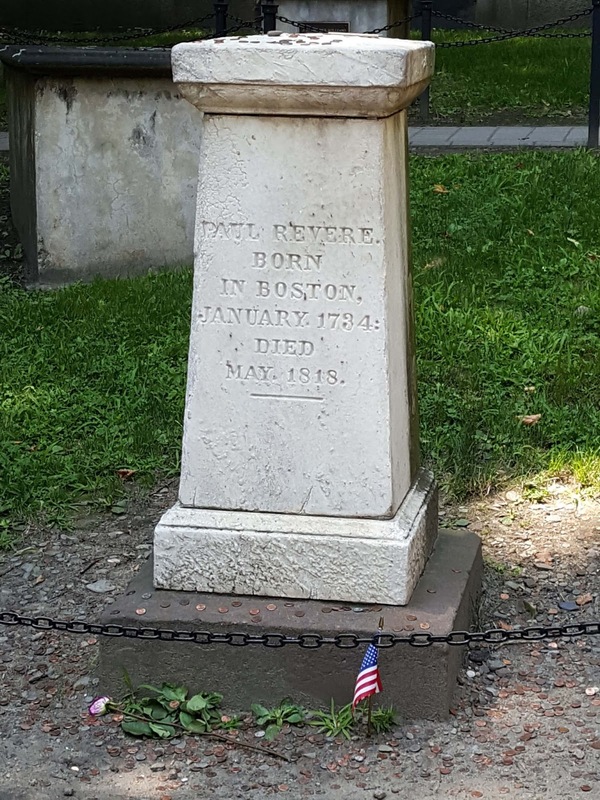 Notable people include John Hancock, Paul Revere, and Ben Franklin's parents. 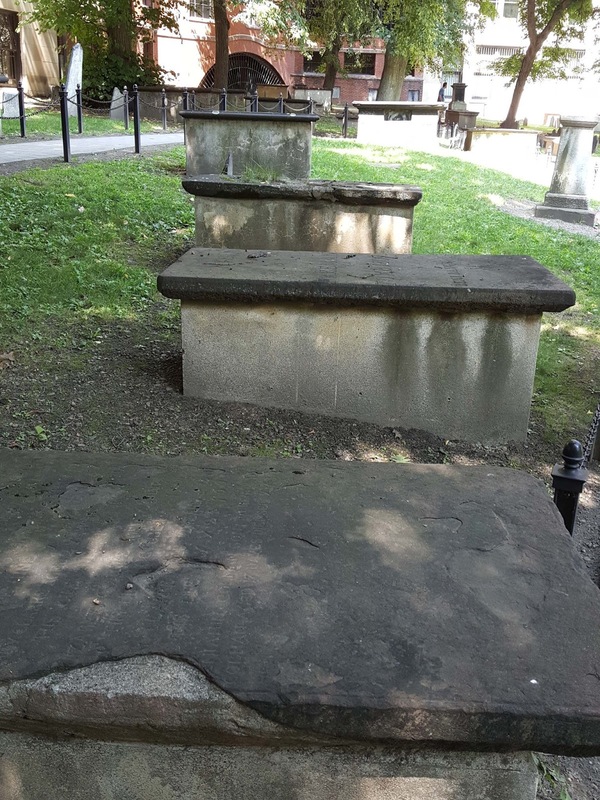 These table top boxes are actually stairways to subterranean tombs. The pilgrims were Puritans. Later, Episcopalians arrived in Boston and wanted a chapel as a place to worship. Since the Puritans wouldn't sell their neighbors any good place to build a chapel, the King ordered a chapel built in a cemetery. 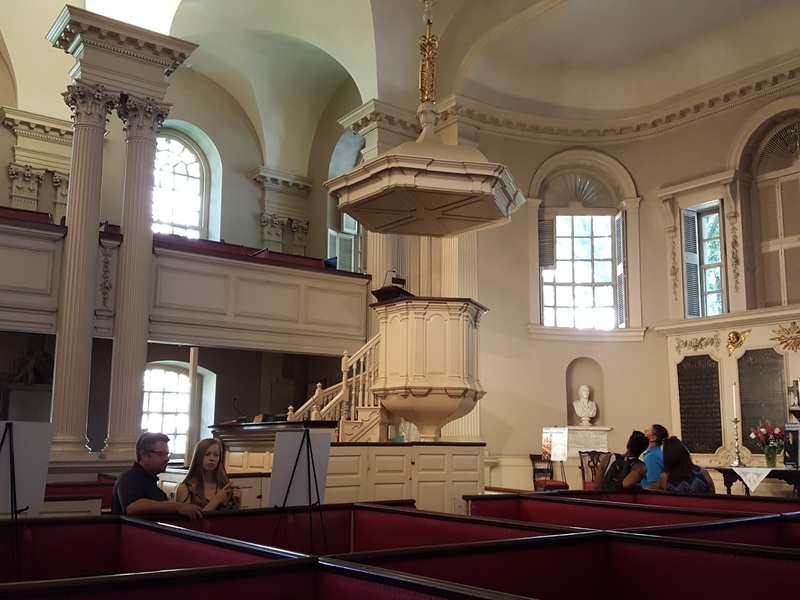 The first chapel was wood. 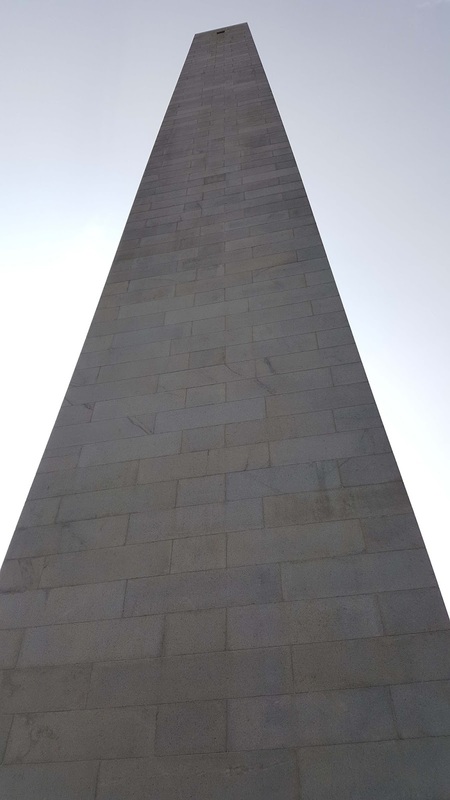 Then in 1749 this granite structure was constructed outside of it and the original was dismantled. This beautiful edifice was the scene of public outcry immediately prior to the dumping of tea into the sea during the Boston Tea Party. 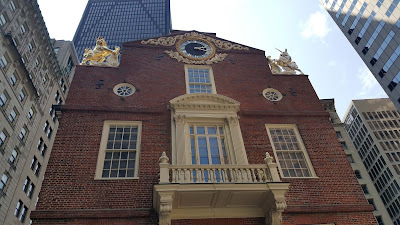 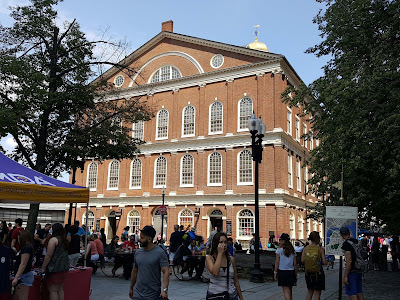 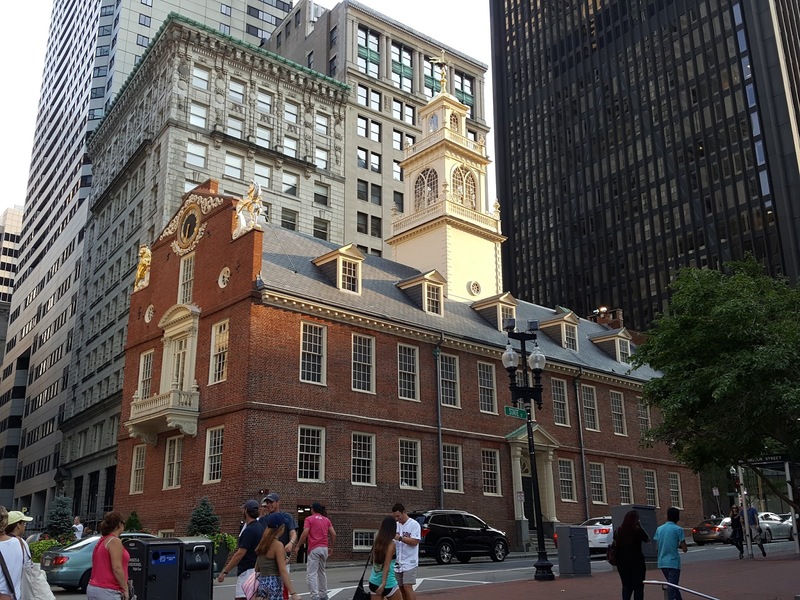 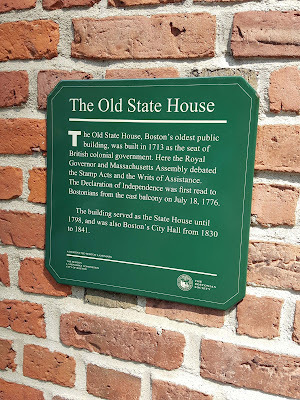 The Old State House was where the Declaration of Independence was announced and read to residents from the balcony. 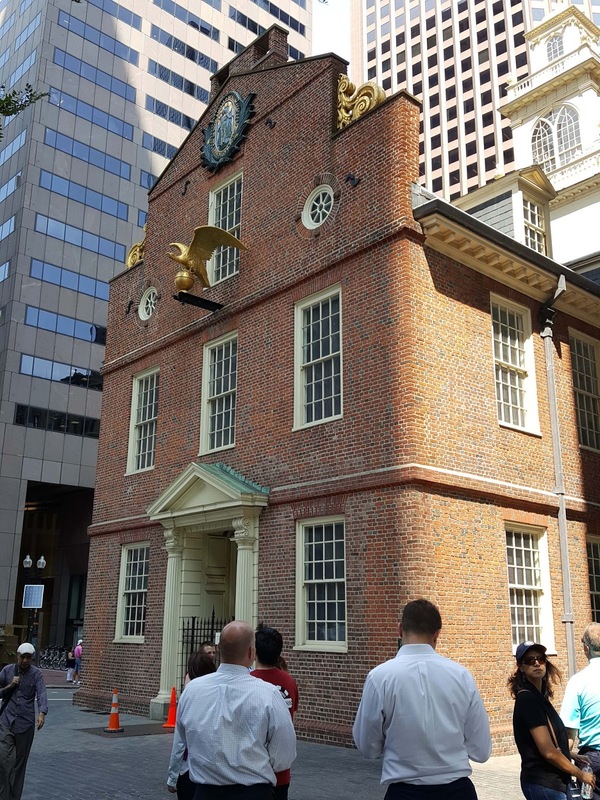 Outside the Old State House is the site of the Boston Massacre. Once a large indoor market, this landmark has been converted back into use as such. 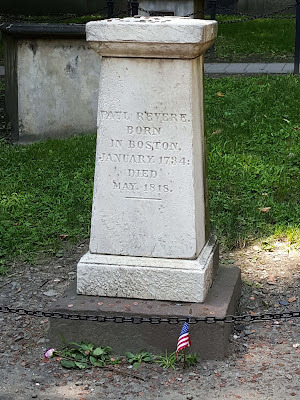 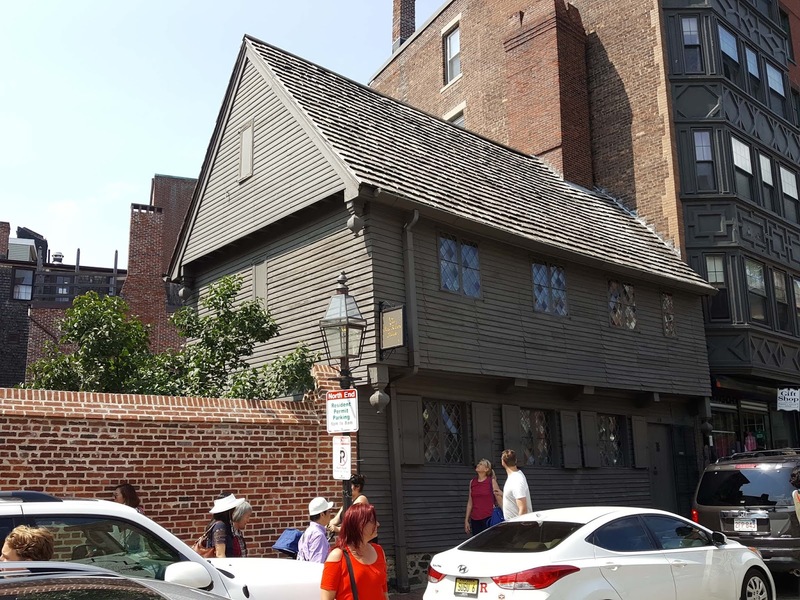 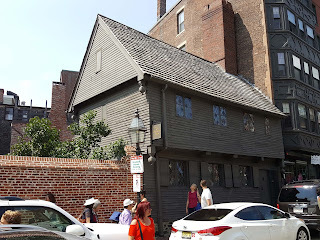 Paul Revere's home was constructed in 1680 and is the oldest standing structure in the city. 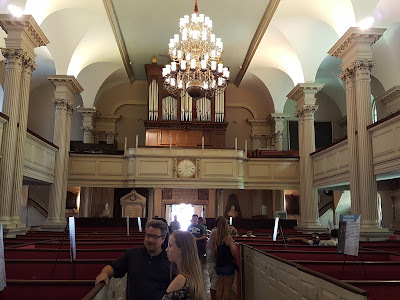 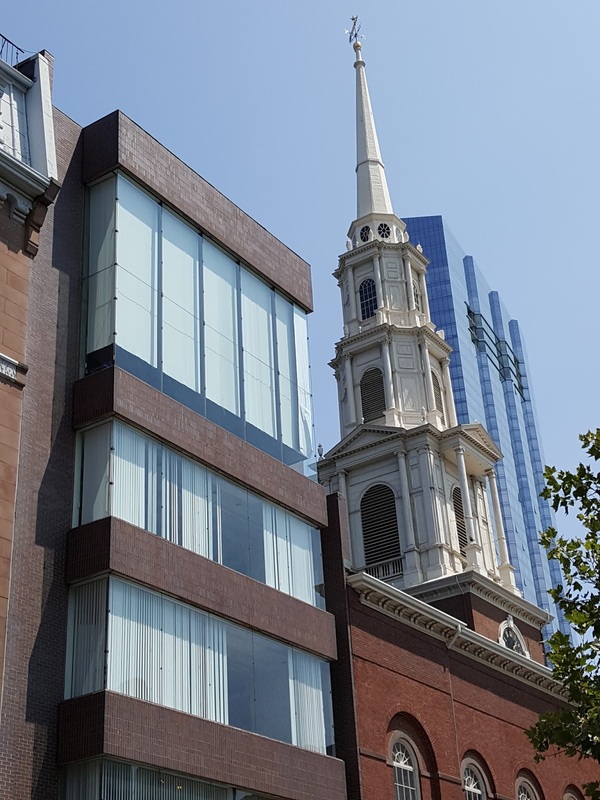 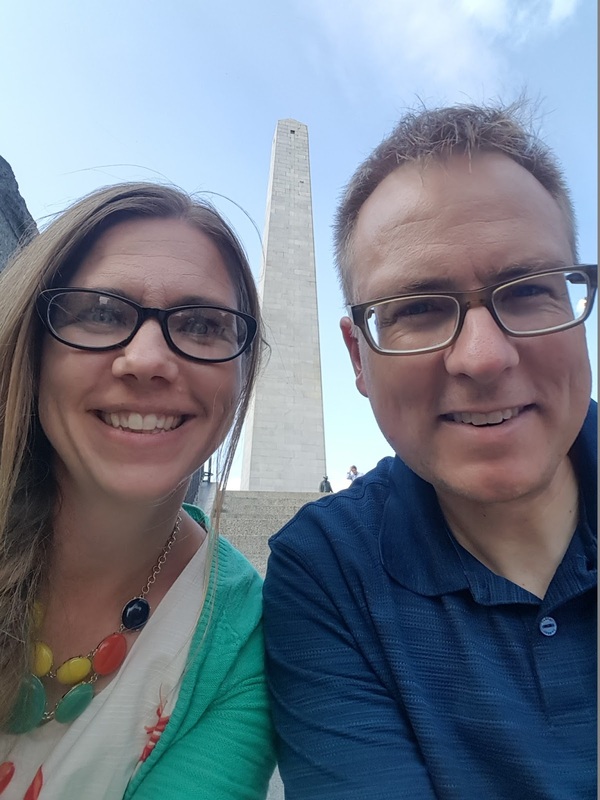 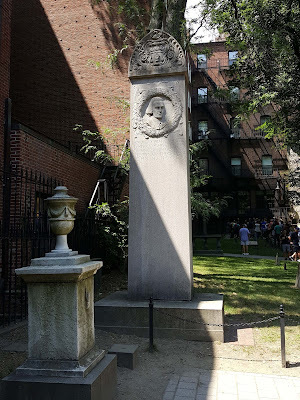 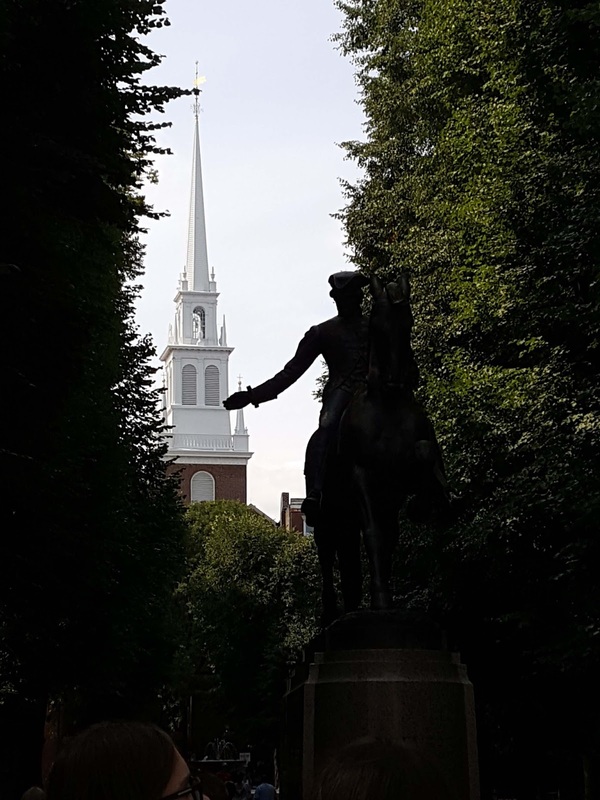 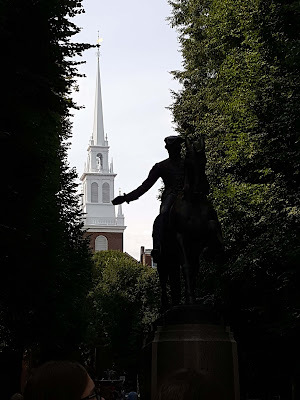 The Old North Church was the site where the lamps were hung from the steeple according to Paul Revere's instructions "One if by land, two if by sea." The USS Constitution was closed to the public, but it was still amazing to see this ship in person. 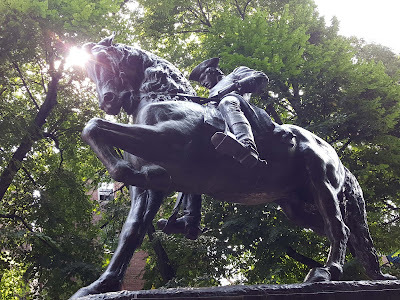 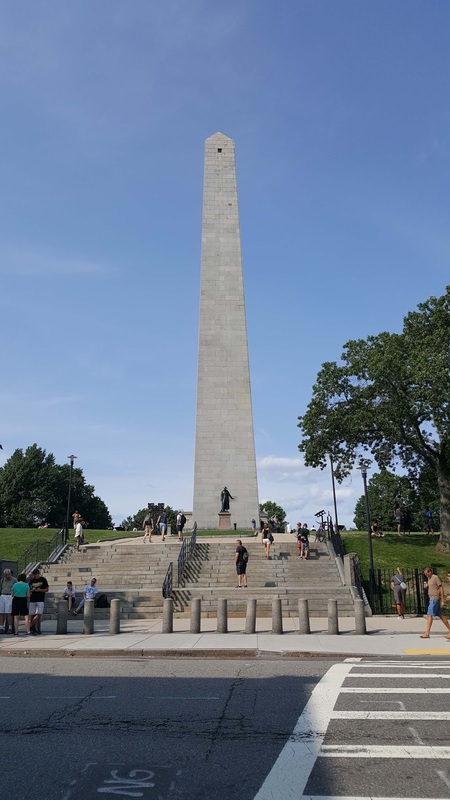 The Bunker Hill Memorial honors the first battle of the Revolutionary War. 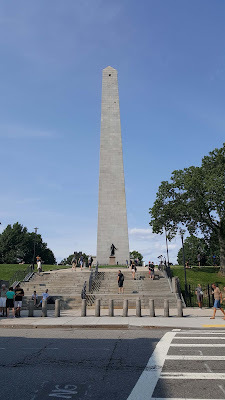 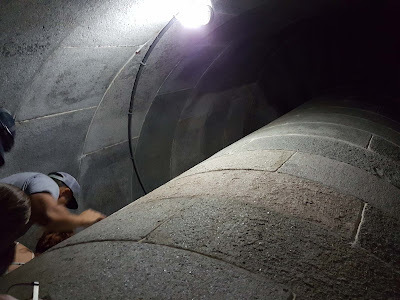 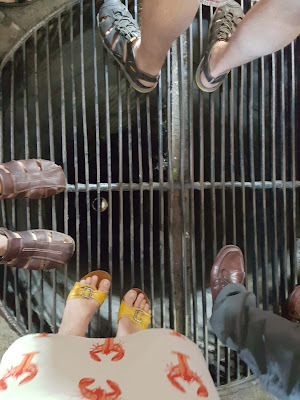 The obelisk is over 220 feet tall and can be climbed to the top. 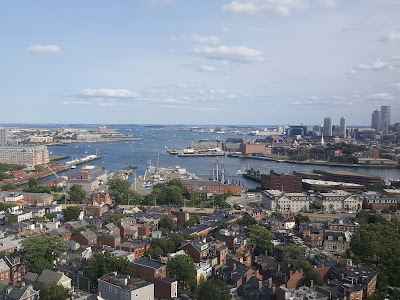 The views from the top are amazing. 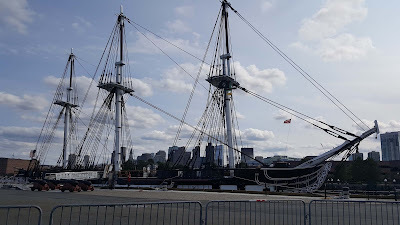 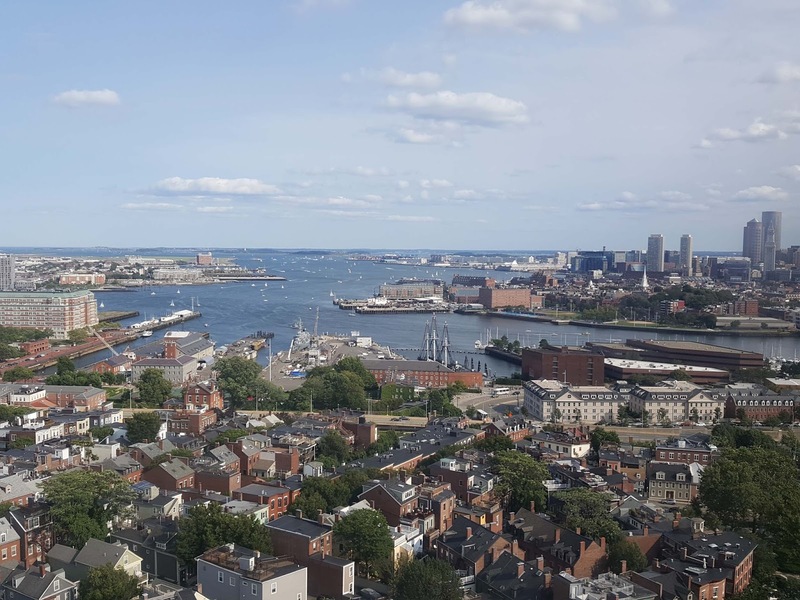 Here is a view of the USS Constitution and Boston Harbor. 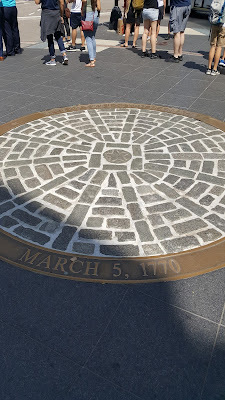 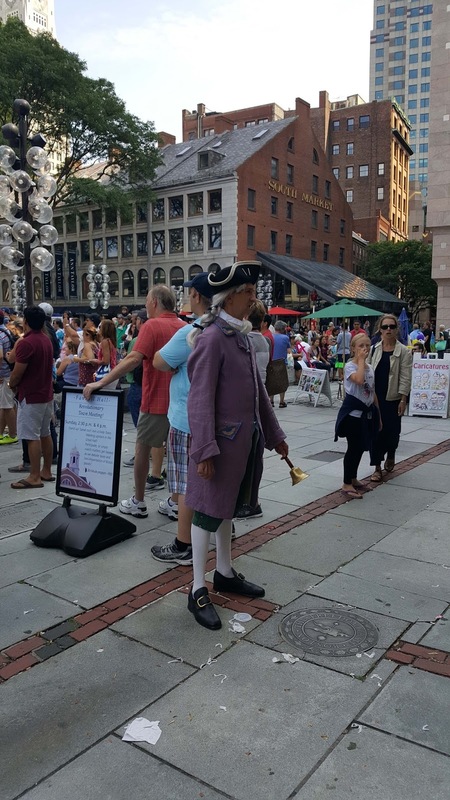 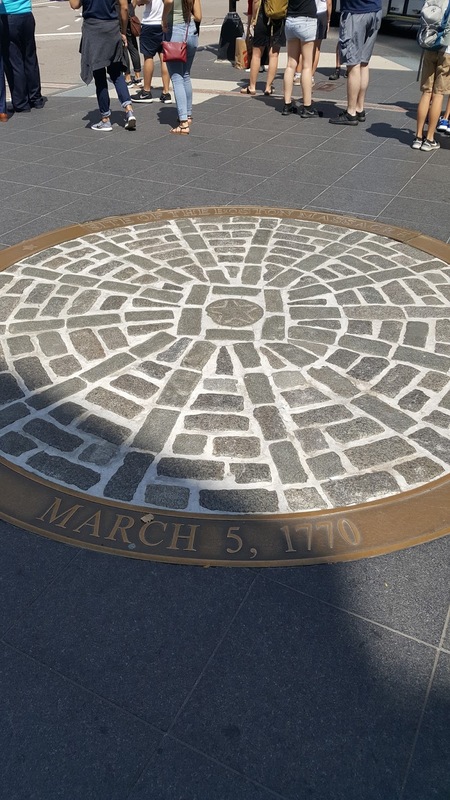 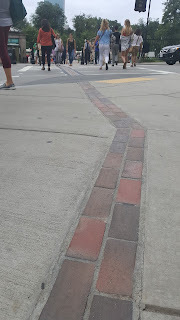 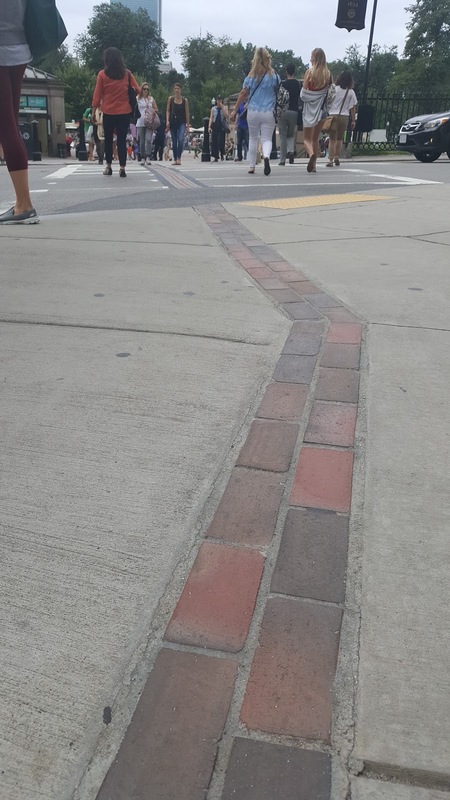 If you ever visit Boston, the Freedom Trail is a must. 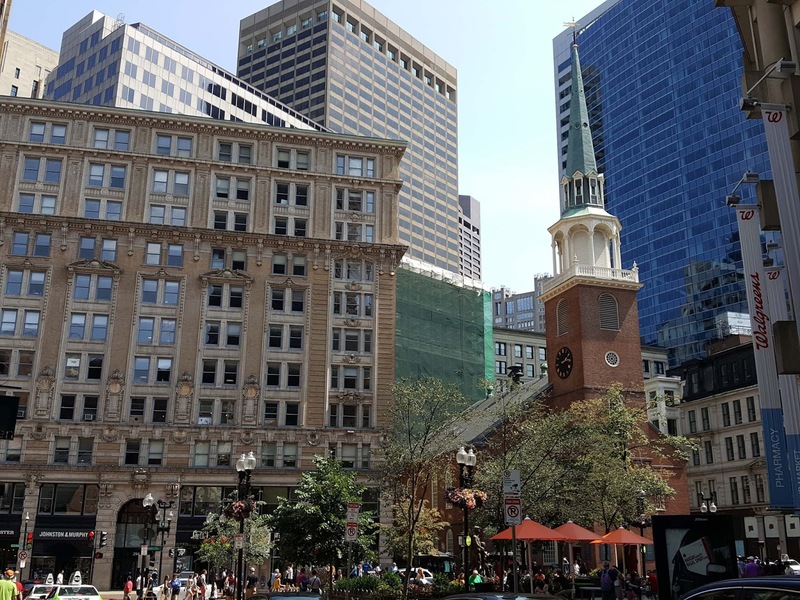 The trail is about 2.7 miles from one end to the other and makes for a great walk through downtown Boston. 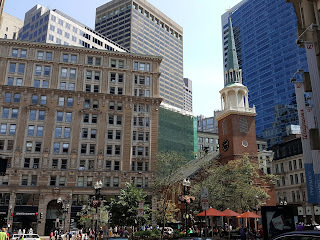 The city is clean and rich to experience in so many ways.